In 1986, Hillary Rodham Clinton said of the Ozark Folk Center herb garden, "It is not just a decorative garden, it is a repository of past knowledge"
This 'repository of past knowledge' began humbly in 1977, when volunteers began to bring their own herbs and ideas to the Ozark Folk Center to start a dedicated herb garden. Volunteers transplanted seeds from their own garden and sowed the idea of the Heritage Herb Garden. Mrs. Warner and the center's other volunteers did, indeed, accomplish their objectives. A testimony to these achievements is the Heritage Herb Spring Extravaganza. 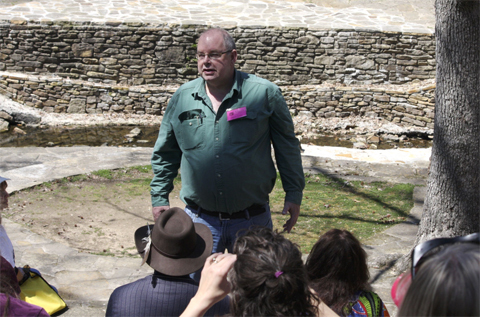 Each spring, leading American herbalists spend a weekend in the Ozark Mountains to teach, share and learn. 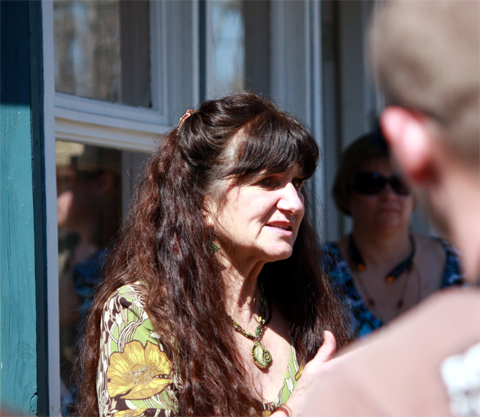 Tina Marie Wilcox, herbalist at the Ozark Folk Center in Mountain View, AR, organizes workshops, invites speakers, sets up walks through the park, a luncheon for all and the participants come. This event started in 1989 as the Garden Gala and has evolved into a gathering of renowned herbalists who come together to share knowledge and been renamed the Heritage Herb Spring Extravaganza. Tina Marie Wilcox, hired as a gardener for the folk center in 1984, continued sowing seeds and ideas of these first volunteers. Today, the herb garden is a living, breathing, ever-growing repository of past knowledge, and a hands-on teaching and learning experience for all who come to the Ozark Folk Center. She has carefully organized the annual Heritage Herb Spring Extravaganza to showcase the herb garden by opening it for the spring season with speakers, teachers, and general fellowship every year combined with fantastic food made from the very herbs picked fresh from the herb garden. The event is the anchor for the Center's spring season opening. Herbalists from as far away as Maine, and as close as Izzard County, Arkansas, students from Louisiana to Oklahoma and beyond, enjoy sharing their knowledge and experience, along with fellowship and food, every year. The Heritage Herb Spring Extravaganza, not your ordinary workshop, is two days of celebration, of reconnecting with nature, of sharing the unique knowledge of herbalists from the folk center and across the country, and of experiencing this ‘repository of past knowledge’ in the present day. Exchanges of knowledge and experience, and question and answer sessions, spiced up their wanderings and laughter was not in short supply. Susan Belsinger, a culinary herbalist, author and photographer from Maryland, trudged with her small tribes around a parking lot loop center seemingly filled with weeds. "Not so," pointed out Belsinger, clad in overalls and wearing her signature brightly flowered rubber boots. "Here's some henbit," she pointed out. And, further along, "Chew on this", she invited, as she agilely stretched and grabbed a handful of Chickweed and said, "Pass it around." The crowd happily chewed as Susan explained, "These and other 'weeds' are usually mowed down... but they can be valuable as medicinal teas or poultices, and many are delicious in salads and cooked dishes." These culinary herbalists used these "weeds", and many others herbs, in planning and, with the help of the dedicated staff at The Skillet, in executing a scrumptious lunch for workshop speakers and participants. Second helpings were common and no one knows how many absconded with the delicious herbal biscuits as they reluctantly departed the restaurant. Tina Marie Wilcox proudly informs that, at her urging, the restaurant at the Folk Center, The Skillet, now uses only recyclable take out containers. "Use everything you can think of to 'make your garden grow'. Compost veggie and fruit waste, put that newspaper down to discourage weeds, don't burn those fallen leaves; use 'em for mulch. And shred those fallen limbs for use on paths." Wilcox believes that almost 100% of what most consider 'garbage' can be used, not discarded to fill up more landfills. Steven Foster, (seen below) who became interested in herbs in 1974 in Maine, bussed one group to Mountain View's city park to view thousands of blooming wild flowers, but upon arrival, discovered that all plants had been mowed down. Undaunted, the laid-back Foster, whose mentor was Rosemary Gladstar, went on with the show. This Eureka Springs, AR, author, photographer, and Chairman of the American Botanical Council, truly enlightened, informed, and entertained. He baited his audience with claims of "aliens in our midst" and explained that at least 2/3rds of all plants in the U.S. were "alien", i.e., brought here, knowingly or accidentally, by scientists and sailors, gardeners and gauchos. Foster invited his audience to introduce themselves, share if they desired, and ask questions of each other and/or of him. The diminutive Rosemary Gladstar, the author of nine books including "Herbal Healing for Women", has mentored more herbalists than she can count. As a youngster, Steven Foster, was mentored by Gladstar. She is the founder and director of Sage Mountain Herbal Retreat Center and Botanical Sanctuary in her home state of Maine. The ultimate professional, Rosemary shared her philosophies and herbal practices while competing with a jackhammer doing renovations in the park. Jennifer Blankenship, a pharmacist, farm owner and supplier of Townsend Spice and Supply, spoke to participants in the cool of the center's auditorium. Ms. Blankenship encouraged blending herbal and traditional medicine, pointing out that herbal remedies will become increasingly more important as the costs of traditional medicines skyrocket. "Your knowledge of the use of herbs for medicinal purposes will be very important." Ms. Blankenship will soon chair The Committee of One Hundred and continue to lead the volunteers in their fund raising activities for the Herb Garden. Kathleen Cannole, the Ozark Folk Center's nursery specialist and artistic gardener, lead groups around inside the center, explaining the genesis of the pond and waterfall, as well as how to best grow some of the herbs native to the Ozark area. Ms. Connole earned a BS in Plant Science and Ornamental Horticulture, "after my kids were grown". She, however, admits that her knowledge has grown in leaps and bounds since apprenticing with Tina Marie Wilcox and beginning work at the center. 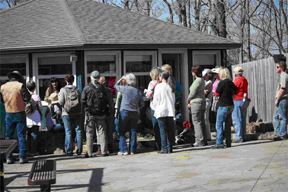 The Spring Herbal Workshop is presented every spring by The Ozark Folk Center. Attendance has grown every year and will continue to do so. This event is a yearly highlight of the Folk Center and makes it a destination for anyone interested in using herbs medicinally. 2014’s event happens every April. filled with fun, entertainment and learning.